After updating to version 6, Enpass crashes after starting. I also tried to reset the Microsoft store app, reinstalled it and tried the normal desktop installer from Enpass. Sorry to hear that the workaround didn't help. 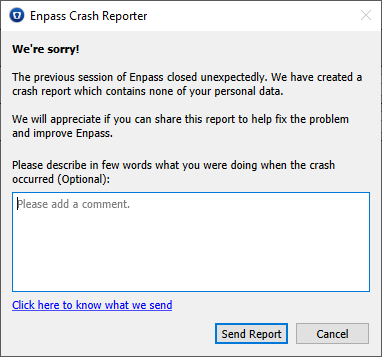 Can you please share the crash report mentioning your name in the comment box so that we can investigate it further. Yeah, we got it. We will look into it and get back to you soon. Befor its works perfect, but now Enpass Destop premium crasht wenn I open it. The workaraound on top can I not handle. 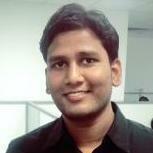 Environment variable is not foundet. Our dev team is already looking into this issue. Till then I request you to please wait and co-operate with us. Now i have the same problem on my Desktop HP. I think there is some problem with HP. I have 3 Notebook and 3 Desktop. 1 Notbook HP, 1 Notebook Dell, 1 Notebook Fujitsu. 1 PC Descktop HP, 1 PC Dektop Asus, 1 PC Desktop Fujitstu. We have fixed some crashed issue in the latest beta version. If you are willing to try before public release you can download it from here and let me know if the problem persists.